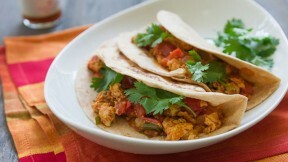 Make this flavorful dish in about 10 minutes for a delicious breakfast or quick dinner. Drain and roughly crumble the tofu onto a piece of butter muslin, and squeeze out the extra water. Rearrange the tofu and then repeat. Add the olive oil to a frying pan over medium high heat, and sauté the garlic, onions and peppers until the onions are starting to brown around the edges. Add the squeezed tofu and sauté until the tofu is just starting to brown. Add the chili powder, salt and turmeric and stir to coat evenly. Add the tomatoes and continue frying until the tomatoes have broken down and the mixture is no longer watery. Garnish with cilantro and serve with warm tortillas.